When you work as at home and take your home party plan training, seriously it is important to keep your audience’s attention. Your audience can mean the difference between a great sale and a total flop. Audience attention is key in any home party plan, and retaining a great customer attitude can be a lot harder than it looks. Here are some effective tips to keep your audience’s attention, even when it can seem hopeless. First of all, be fun! Audiences feed off of the energy of the presenter, and if you give off a negative or unsure attitude, your customers and audience will grab that vibe and run wild with it. Keeping a fun and positive atmosphere during your home party plan will not only allow them to have fun too, but allow you to relax and enjoy yourself. In short, you can soon reap the financial rewards for your fun efforts without even trying. Even better, an audience that likes you is a customer base that will be loyal as well. Engage your audience so that they don’t get bored. Try doing demos on the people in the room who appear to be drifting off into space to draw them back to your attention and get them to come on board. When you let the audience get involved in your presentation, you are doing two things: first, their involvement makes your product and presentation more enjoyable, and you are also making yourself more approachable. An audience trusts a presenter who lets them be part of the action, and letting your disinterested audience take part grabs the whole crowd. Keep your presentations exciting, short and to the point. People recognize a sales pitch when they see one, and if you go too ‘infomercial’ on them, they will quickly lose interest. Instead, get your main points out about your service or product straight out of the gates, and get right to the benefits. Invite audience questions and challenges just to keep them on their toes, but don’t go overboard with explaining things and demos or you will just plain lose even the most engaged audience members. Finally, enjoy yourself. If you don’t like speaking in public, choose to go a more demonstrative route. Your audience needs to know that you enjoy what you are doing, or else they won’t pay attention for long. An audience is only as excited about something as the speaker or presenter is, so you should be motivated, energetic, and ready to challenge the audience to hear you out. If you are pumped and motivated, odds are your audience will be as well. Enjoy yourself, and use your audience to give you the energy you need to give a great performance. Party plan success is guaranteed when you use proven systems! 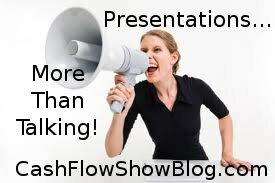 Visit the #1 party plan sales training center on the web and learn the Cash Flow Show system of party presentation!